To the front of the property there is a designer kitchen and open plan dining area leading to a light and spacious living area extending, through bi-fold doors, into the rear garden. In addition, you'll also find a WC and under-stairs storage cupboard. Upstairs, is a large dual aspect master bedroom with en suite shower room, with heated towel rail, and the option of fitted wardrobes. 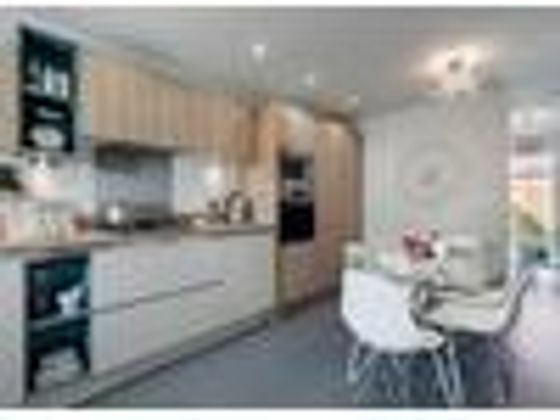 There's a second dual aspect double bedroom and a generous single served by a family bathroom, with full-height tiling, contemporary sanitaryware and heated towel rail. On the landing is a storage cupboard. Heating controlled by Hive wireless thermostat. Enquire today.SpecificationGeneral ? Bi-folding doors ? Choice of stylish internal doors with chrome-finished door handles ? Ceilings & walls finished in off-white emulsion throughout ? Gas central heating with radiators throughout ? Loft and exterior wall insulation ? Heat, smoke and CO2 detectors Kitchen ? Fully fitted handleless designer kitchen in a range of colours and styles ? Stainless steel fan oven, hob splashback, built-in microwave oven with grill and 60cm gas hob ? Integrated extractor hood ? Fridge/freezer ? Stainless steel splashback behind hob ? Single bowl stainless steel sink and drainer ? Choice of designer chrome mixer taps ? White finish sockets above worktops ? USB charging point ? Downlights underneath wall units Bathroom ? White contemporary sanitaryware ? Shower over bath, with glass and chrome bath screen and a choice of complementary bath panels ? Range of tiling in a selection of colours ? Quality designer taps & fittings ? Chrome heated towel rail ? Shaver socket ? Chrome low voltage downlighters in ceiling External ? Front entrance light ? White UPVC fascia & soffit ? White UPVC double glazed windows with locking system ? Front GRP doors with multi-point locking system ? Driveway ? Garage including power and light^ ? Allocated parking ? Outside tap ? Turf to rear garden with patio/decking area? Allocated Parking or Driveway for these house types is Plot Specific. Speak to your Sales Advisor for more details. ^Dependent on location of the garage (where applicable). ? Speak to your Sales Advisor for regional variations.About Chacefield LoanWe've just released our next phase of homes at Chacefield Loan Visit us now to find out more. Chacefield Loan offers a range of 2 and 3 bedroom new homes for sale in Falkirk. Each features bi-fold doors, exclusive kitchen designs, integrated appliances, Hive smart energy and much more included in the price. Simply, more home to begin with. If you've always promised yourself a new home that's a little bit special, then we recommend you visit us at Chacefield Loan. This popular development offers an exclusive selection of brand new house for sale in Falkirk, all built with our superb new specification throughout. Denny benefits from a multi-million pound regeneration programme and is fast becoming a smart and sought-after location for local buyers and those looking for genuine rural tranquility in the heart of Scotland. Surrounded by countryside and with stunning river walks, Chacefield Loan offers families, professionals and downsizers a peaceful home in which to relax and enjoy some of Scotland's prettiest scenery. Chacefield Loan is far from remote. It is perfectly placed for travelling east or west, being only 30 minutes' drive from Glasgow or Edinburgh. Falkirk is just 7 miles away and it's here that you can find all the main High Street stores and shopping centres. Historic Stirling is also nearby; just 20 minutes away. Commuters will find Chacefield Loan is a great place to escape the everyday hustle and bustle and families will appreciate the choice of local schools; there are three primary schools within 1 mile of the development and a choice of secondary schools and colleges within easy reach. Visit us today to find out more. Property advert Ref 4276433 - Is a property advert for marketing purposes only, the information has been supplied by the owner, estate agent or property portal and The House Shop makes no warranty as to the accuracy or completeness of the information. Furthermore we have no control over the adverts content. This property advertisement does not constitute property particulars. Please contact the advertiser to obtain any information regarding The Energy Performance Certificate regarding homes in England and Wales or Home Report for residential property in Scotland.